This highly colourful and versatile composition comprising of bold figures, straight geometrical formations and symmetrical line-work represents Vishnu in his Narsimha form killing Hiranyakashyapu, the fountain-head of one of the clans of demons. 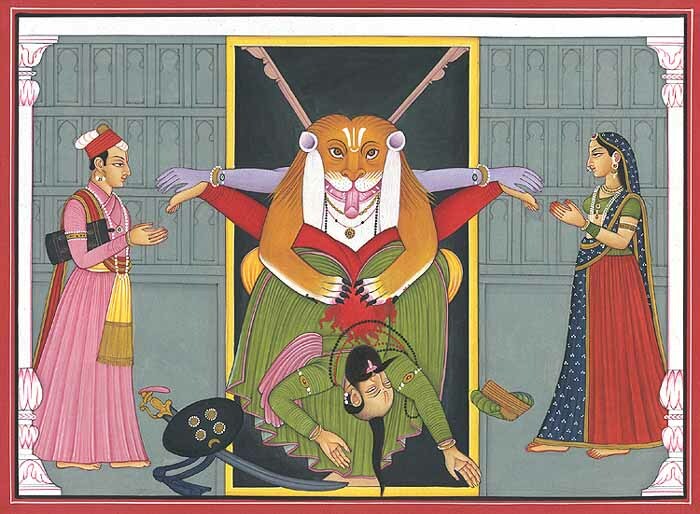 Hiranyakasyapu and Hiranyaksha were the two sons of Diti by sage Kashyapa. They pleased Brahma by their penance and won from him the boon of invincibility. This made them arrogant and atrocious. 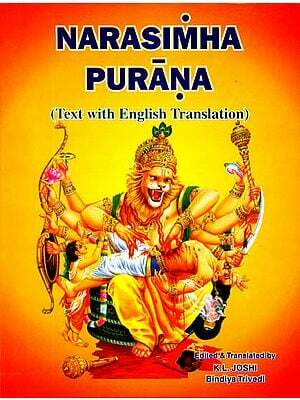 Hiranyaksha did not spare even Brahma and stole away his Vedas and dragged the earth to his underworld domain. On Brahma's prayer Vishnu incarnated as Varah, the Great Boar, and not only brought back the Vedas and the earth but also killed Hiranyaksha. Hiranyakashyapu was deeply aggrieved and hurt on the death of his brother Hiranyaksha. He decided to avenge his death by killing Lord Vishnu and as his first step prohibited Vishnu's worship and rituals all over. He deployed his demons to inflict death and death-like atrocities on Brahmins, Kshatriyas and others who performed his rituals or uttered even his name. He, on the other hand, devoted himself to a hundred year rigorous penance. At its end there appeared Brahma and blessed him with invincibility against any of gods, men, demons and animate and inanimate beings. He also declared that Hiranyakashyapu would be killed neither inside nor outside a house, neither during day nor during night and neither on earth, nor in water or sky, nor by any armament. Inflated with greater ego and confidence Hiranyakashyapu returned to his capital. When Hiranyakashyapu went for penance, his wife was pregnant. During her pregnancy sage Narada regularly visited her. He used to elaborate to her the glory of Vishnu and his great exploits. The child in her womb, named Prahlada after he was born, also heard it and decided to devote himself to Lord Vishnu in the womb itself. Later the teacher appointed to teach him too injected into Prahlada's mind the cult of Vishnu's devotion. Thus, when Hiranyakashyapu came back, he found Vishnu's rituals performed in his own house and his son devoted to Vishnu who was his greatest enemy. Efforts were made to dissuade Prahlada but without result. When both, neither fear nor love prevailed, attempts were made to put him to death but he escaped it every time and his faith in Lord Vishnu deepened. One day at dusk Hiranyakasyapu encountered his son just outside his bed-chamber. The demon chief pointed at the column of his chamber-door and asked Prahlada sarcastically if his Vishnu, the so-called omnipresent, existed in that door-frame too. Before Prahlada could say anything, the door- column burst and there emerged from it the Narasimha, or the half-man-half-lion form of Lord Vishnu. He charged on Hiranyakasyapu, lifted him in his lap, cleft his abdomen with his nails and killed him. In the painting Vishnu's unexpected entry catches Hiranyakashyapu unprepared. His shield and sword hence fall on one side and the turban and crown on the other. The artist has painted behind the lion form a couple of blue hands for symbolising Vishnu's presence and two pieces of the cleft door column. The ash grey tint of the wall behind suggests that the day has set but the night is yet to emerge. 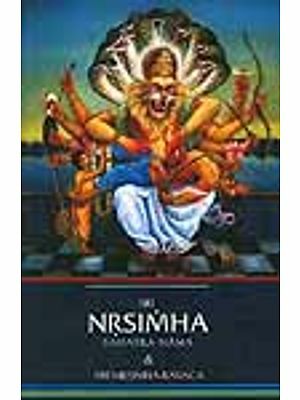 Narsimha kills the demon without a weapon only by his nails. Prahlada and his mother witness the divine act.